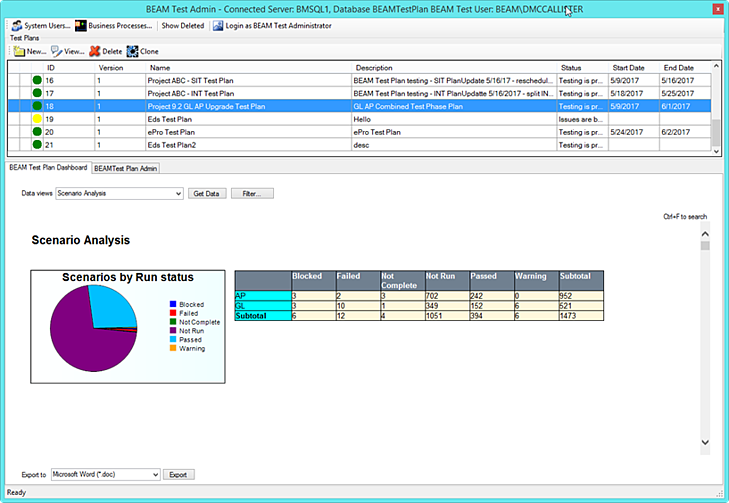 Now available, BEAM Test Manager is designed to define, schedule and monitor application testing. The testing of an enterprise application, during implementation or after an update or upgrade, is a process to ensure that the application produces the expected results after the change. Whether application testing is done manually or with automated scripts, a great many steps need to be managed between a number of people, processes, departments and devices to ensure the application works as expected. BEAM Test Manager provides organizations with the information needed to facilitate these efforts. The application testing process can be overwhelming and difficult to plan and control. BEAM Test Manager provides new tools to co-ordinate the testing process and to enhance communication and collaboration with test team members. The strategy for testing is to define the scope, the level and objectives for the plan. A plan also defines criteria for success, along with resource requirements. The test plan is broken down into a set of test scenarios. Each scenario can be further refined into individual test steps, with the set up details and expected results. BEAM Test Manager scenarios can be grouped into logical units by application, business process, organizational unit , etc. BEAM Test Manager can import previously defines plans (Excel) and existing plans can be cloned and used for subsequent similar test cycles. Image 1 Main Test Manager dialog showing scenarios, assignments, and results of any scripts run for the selected assignment. Each Test Plan - this screen shows two - has its own scenarios (middle of screen).. Scenarios are assigned to individual team members, along with expected start dates and end dates. Testers can view their assignments and the schedule and begin creating or executing tests to fulfill scenario requirements. 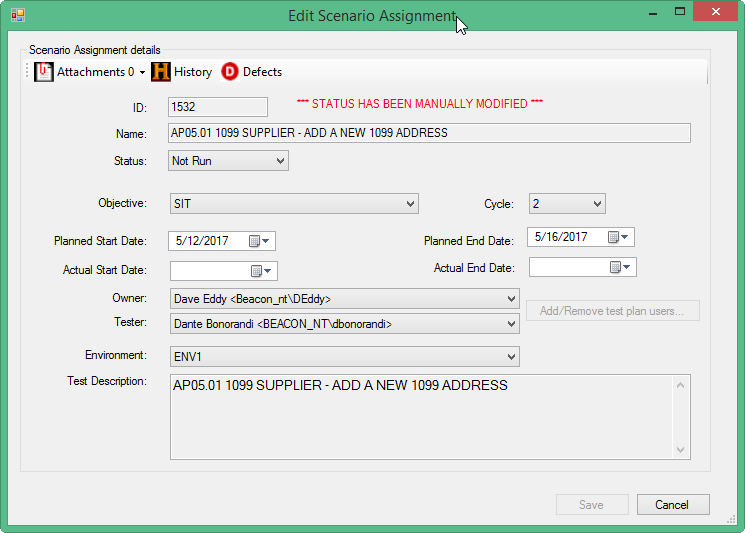 Image 2 The Scenario Assignment Workbench provides tools for planners to select assignments and update owners, start and end dates, etc. Image 3 The edit dialog for an individual assignment showing fields that are tracked per assignment, with related changes in status. After executing a test or test script, users can report the results from the test run. 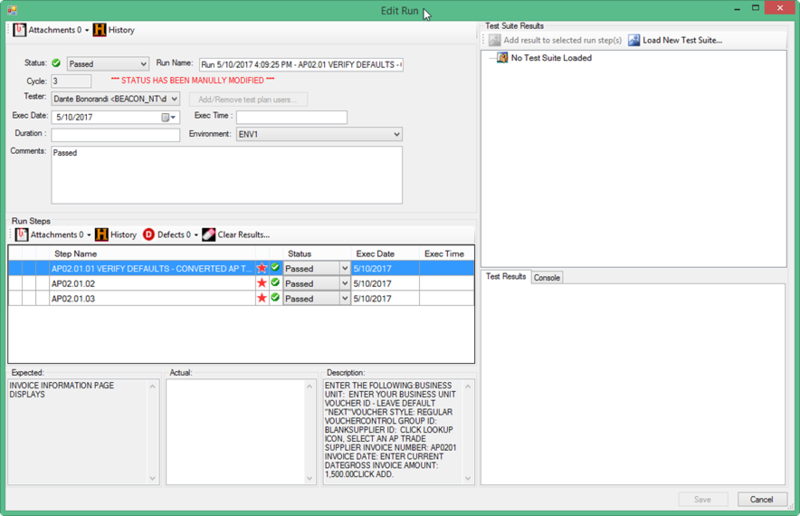 Test scripts run within BEAM Test will have all details, such as execution date, success/failure results, failing reason, etc., automatically entered for the user. Attachments, screenshots can be posted with the results, along with any comments from the user. Information relating to defects identified as a result of this test can be entered by the user at this time. The BEAM Test Manager Dashboard/Pivot Grid provides an overall picture of the project and has the tools to drill down into the details of each test scenario. The Defect Dashboard provides summary information on defects, with links to each item. Image 7 Test Planning dashboard showing a user specified analysis of scenarios and their status by business module. 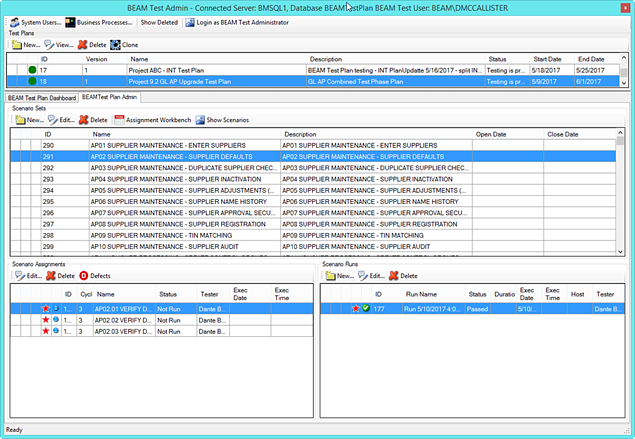 BEAM Test Manager is a Windows application, running on Windows or Windows Server. It will be provided as an enhancement to all existing and new BEAM Test customers. 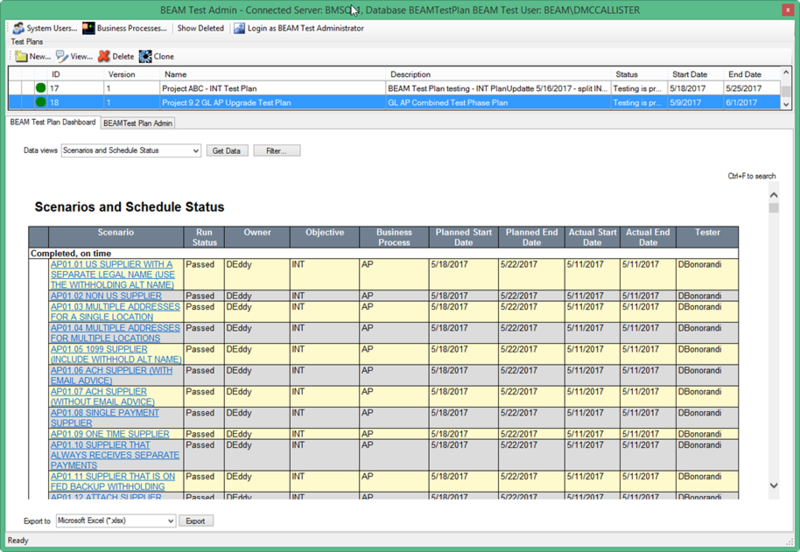 BEAM Test can be licensed for PeopleSoft, and a separate version for Oracle SaaS applications is near completion. BEAM Test Manager is designed to run with BEAM Test but can also be run independently, or with test tools, such as PTF, OATS, and others. BEAM Test Manager will be available soon on AWS, Azure and Oracle Cloud platforms, initially on Oracle Cloud (OCI)..